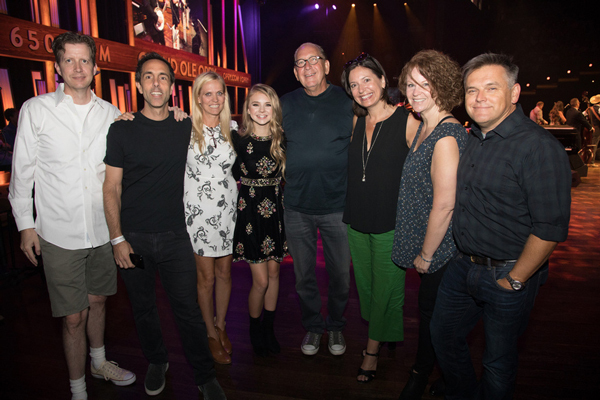 Warner Music Nashville’s newest addition, Sweety High’s rising star TEGAN MARIE made her dreams reality when she debuted at the Grand Ole Opry on August 19. Just hours after announcing her label signing, the young vocalist stepped onto the revered six-foot circle to perform two originals for the full house: “Keep It Lit” and “Roots,” which pays respect to a number of legendary Country artists who have performed in the same historic spot including Johnny Cash, Dolly Parton and Garth Brooks. Met with gushing applause, Sally Williams (GM, Grand Ole Opry; Sr. VP Programming & Artist Relations, Opry Entertainment), Dan Rogers (Sr. Director of Marketing, Grand Ole Opry), John Esposito (Chairman and CEO, WMN), Lisa Ray (VP Brand Management, WMN), Brad Bissell (agent, CAA), Frank Simonetti (Co-Founder and CEO, Sweety High) and Veronica Zelle (Co-Founder and CCO, Sweety High) congratulated her on a stellar performance. "Playing the Grand Ole Opry was the most amazing thing I have done in my entire life,” Marie said. "Everyone there was so nice. It was beyond a dream come true." With a larger-than-life voice, 13-year-old Country singer-songwriter Marie was discovered by leading Gen Z girls’ media platform Sweety High when her father uploaded videos of her cover songs to their site. She has since catapulted into the national spotlight with several high-profile media performances and appearances including ABC’s Good Morning America, PBS’ star-studded special Smokey Robinson: The Gershwin Prize and the 2017 Radio Disney Music Awards. Last year, the Flint, MI, native released the song, “Lucky Me,” to benefit the children affected by the water crisis in her hometown. Continuing the momentum, her breathtaking rendition of Florida Georgia Line’s #1 hit song, “H.O.L.Y.,” racked up over 17 million views on Facebook alone. Marie has amassed over 75 million video views and receives over five million engagements online each month. She’s also had a string of impressive performances, sharing the stage with singers Cam, Smokey Robinson and duetting with Kelsea Ballerini. This past spring Marie appeared at CMA Music Festival on the Radio Disney Country stage and at California’s popular Country music festival Stagecoach to great acclaim. She also just wrapped up a six-city tour with Pepsi MidAmerica and is currently writing for her debut album. For more information on Marie, visit teganmarie.com.